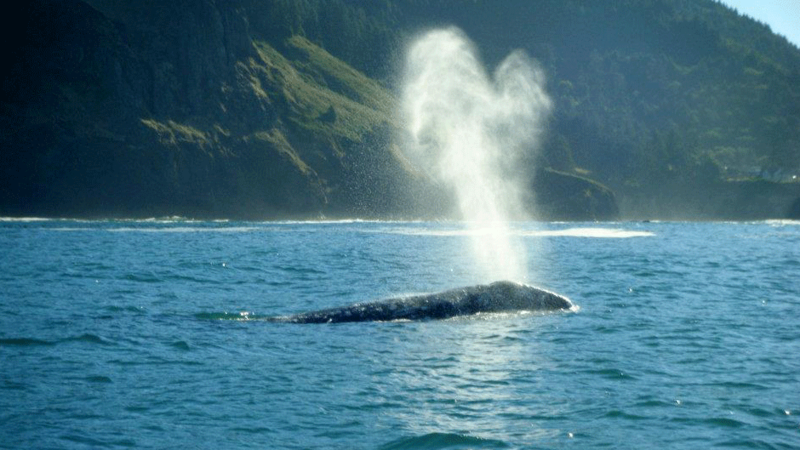 Whale’s Tail Charters offers Oregon whale watching tours in Depoe Bay. Join us for an exciting and thrilling ride to see gray whales and other marine life. Here you can learn about Depoe Bay’s resident gray whales and experience transiting the world’s smallest navigable harbor. Our trips are fun, informative, and we are dedicated to making your whale watching trip an experience of a lifetime. The boats were specifically designed for marine mammal viewing. Our high-speed whale watching tour is the fastest, most comfortable way to view the ocean’s most magnificent animals. We have latest navigational and safety equipment, and have been inspected and approved by the state of Oregon. We offer excellent customer service, first class vessels, the highest possible safety standards along with on-the-water education of whales and marine life. While maintaining a fun and professional atmosphere we emphasize science and conservation. Are captains are dedicated to ensuring that your time spent whale watching is the highlight of your vacation. While we journey out to find the whales, you’ll have the opportunity to see a diverse marine ecosystem, including harbor porpoises, sea lions, pelicans, and seals. This is a great way to enjoy the natural wonders and spectacular wildlife that live off the shores of the Oregon coast. We live in a unique part of the world where Mother Nature provides us with abundant sea life. See these incredible creatures in their natural habitat. This is all about making memories for the entire family.